This is my answer to so how should the office be, then? and so how does your office look? , both of which are are entirely reasonable things to say to me, particularly this month. If you haven't talked to me about work environments and productivity, this post may be one to skip. I've I've worked at home most of the time since 2005, in a room that looks different from the rest of the place. The point of that is to create a natural mental barrier between work and home. Most people use a barrier called commute , but my variant wastes less time. Overall appearance: There's an off-white carpet instead of the wooden floors at home , and the room looks dense or even cluttered, not sparse like the other rooms. The window faces south, so I have a white cotton curtain to take the edge off the light without darkening the room. For the winter I have a clever ceiling lamp with both fluorescent tubes for brightness and halogen to improve and vary the light colour. There are two desks with space for a chair between. One desk is a sit/stand desk from OKA Büromöbel; it is the home of my keyboard and screens. Everything else on this desk is peripheral and subsidiary. The desk makes clear that keyboarding is the activity. Since keyboarding isn't the only thing I do, I bought a fixed-height desk of similar appearance, and positioned it so that I can swivel from one to the other, but cannot see both at once. Both are wood veneer, with a light, warm colour. I want to be productive here, and while gray plastic surfaces may be durable and easy to clean, they're bad for the soul. The room is very quiet. I chose hardware with quiet fans, positioned the fans far from my ears, and the carpet dampens the noise further. On the walls I have a whiteboard, an Yves Klein reproduction and a nature study. I have a feeling that dust hurts productivity, so I fixed power strips and most of the cables to the undersides of the desks with cable guides, velcro loops, screws, whatever was necessary. It looks messy, but the carpet is cable-free and easy to vacuum. Desks, chairs: Some sit/stand desks have motors, others are raised and lowered by hand. I don't think that really makes a difference. What's important is that it can be adjusted properly. 3cm increments are much too coarse. The proper algorithm for sitting down is: Raise/lower the chair until it's about right, slide in under the desk and place one hand on the keyboard, then then lower the desk until your elbow angle is about 90 degrees and the hand feels right. The proper algorithm for standing up is to press the raise button, put the other hand on the keyboard when the table approaches the right level, and release the button when it's perfect. Adjust if needed. In addition to the work chair I also have a reading chair, a nice inexpensive affair from Ikea, positioned so I can't see the screens while reading. I've had that one in my last three offices, and I really should wash the seat cover by now. No bookshelves though, which is a bit of a bother. Monitors: There are five or six monitors in my office. I have three connected to my main desktop, and I think that's the right number: Space enough for all the windows I need open regularly, with some to spare. These are expensive Eizo monitors (they cost almost as much as the rest of the office put together) because I look at them for hours every day and appreciate their solid colours. They're simply easy on the eyes. 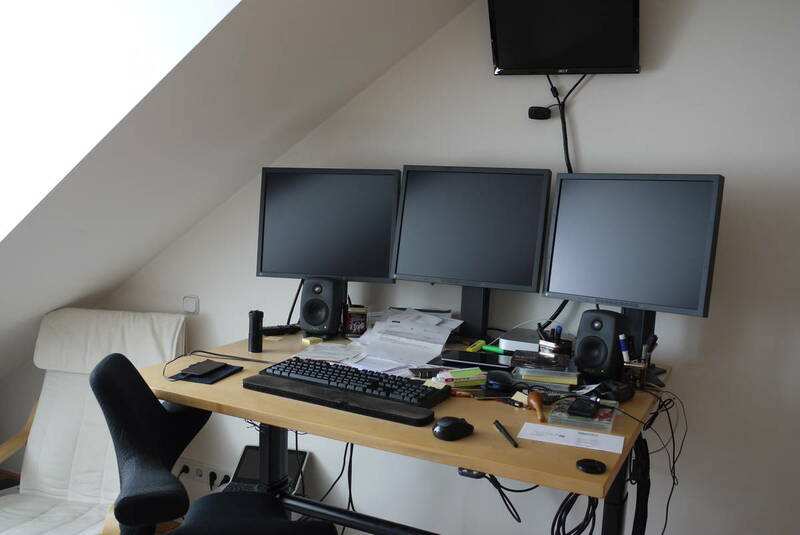 I have two more screens at the moment, one for video conferencing and one connected to a test device. Those are dead cheap. And then there's a laptop, usually closed. Other hardware: Mostly unremarkable. I spent money on speakers, because it helps with understanding what people say during video conferences, and somewhat less money on a fat black Posca pen to dampen all the insistent blue LEDs. The rest is ordinary. Why so much bother? (Added 2018.) Some of the things I've done are about a more peaceful office, in one way or another. Fewer notifications in my field of vision, less noise. Those are obviously good. But the sit/stand desk and chair? Would I really be less able to concentrate if I had to sit in the same position all day, every day? And would I really be less able to read on paper if I were able to see the screens while reading? I'm not sure. I think being able to choose posture and position freely lets me concentrate well more of the time, but I have no data. What I have is my attitude: Ideas for improvement are good, trying them out is good. The rest of what I've done was so simple and easy that it was worth doing just because they might work: Velcroing all the cables for easy vacuuming, putting pictures I like on the walls, etc. I've wanted more RAM and a third monitor for a while. Upgrade time. I hate upgrading hardware, it's the worst of chores. Computers are good. More computers are better. But more keyboards are not. Swapping keyboards all the time was how I first ruined my wrists, almost twenty years ago. My neighbour is putting up another concrete building and I don't like noise. For the past few days I've used a Nuforce μDAC-2 together with Bose QC15 headphones. I tried the QC15s alone, but they don't suppress the construction noise very well on their own. They do better when fed music. The μDAC-2 does well. It's not exactly highend (for context: I think Musical Fidelity makes highend gear, and I consider most Bose devices to be overpriced beep-beep gadgets). But it also doesn't offend me like most computer audio gadgets. It's pleasant, and allows me to work in complete disregard of the $#$@# concrete mixers. Well worth the price. Tidying my office, chapter 17, in which beloved hardware is less beloved than a usable shelf. I'm throwing away the keyboard Cherry made for me sometime around the middle nineties. Stronger: I have two desks, and both are now reasonably tidy. I've had a tidy desk before, such as when I moved to a new office in 1998, but this time no force majeure is involved. I tidied my desks, and kept at it until I was done. Three days. I congratulate myself. My mother would, too, if I were to tell her.